At the end of July, we got sick of the heat and humidity of Padova and boarded Enrico's old motorhome for a trip to France. First stop was the famed crag of Ceuse, home of Biographie and other famous test pieces. 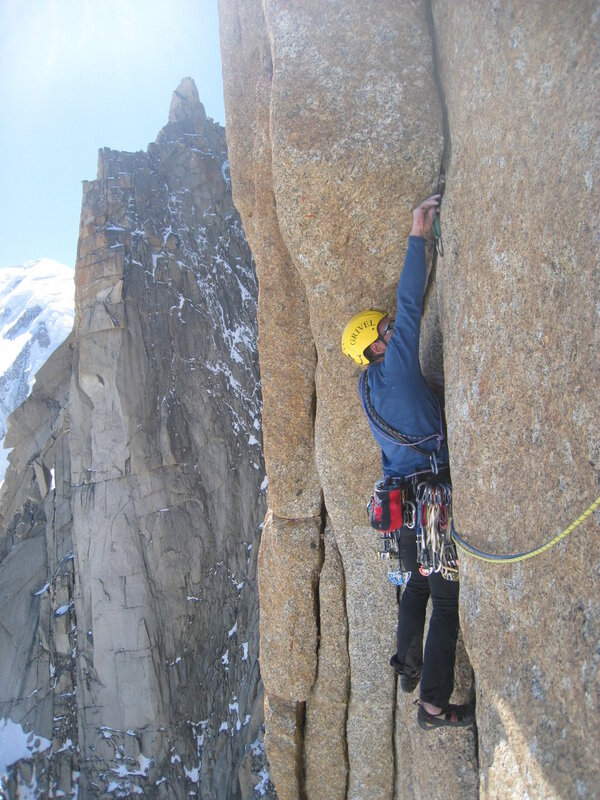 Patrick Edlinger (RIP) didn't have any money when he developed the crag; the result, highly technical and pumpy climbing on bullet-proof limestone and really spaced out bolts. Nothing like cruxing out way out from the last bolt, racing the pump clock to no avail... we gradually got used to the whippers and simply enjoyed the air time. On the second day, Enrico managed to fall executing the tricky starting moves of the famous Blockage Violent without however having clipped the first bolt. I was still dutifully spotting an imaginary climber, as he proceeded to hit the ground, badly spraining his ankle, which assumed a strange round shape and a nice blue color to go with it. It appeared that this would be the end of our alpine ambitions for the summer. Yet, the seasoned alpine guide from Padova was not that easy to stop... in the following days, he continued to hike and climb, treating the ankle with a strange ointment and cold water from the spring at the parking lot. After ten days, we had had about enough of the crag and the crowds. We hit the supermarket in Gap for provisions, and raced back to Courmayer, on the Italian side of Mont Blanc. Enrico drove like a mad man, while I was organizing gear at the back; we caught the last cable car to Rifugio Torino with a few minutes to spare. At the Torino hut, we hydrated with a few liters of beer, before starting out the approach to the Grand Capucin, loaded like mules. We had everything for a few days out in the glacier; beer constituting a large part of the weight. We were gasping for air on the approach, but spirits were high. The weather was awesome, clear skies and an amazing stillness enveloped the range. Under the weight of the haul bag, I glanced at the familiar peaks; the jagged Dent du Geant, the north face of the Tour Ronde, the Aiguille du Midi in the distance; I felt strangely at home. 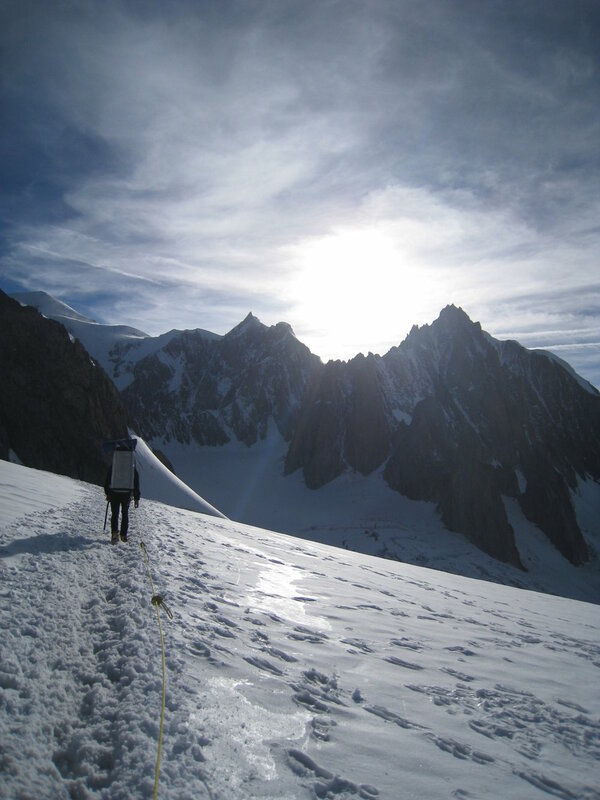 We arrived at the plateau under the Grand Capucin as the sun was setting, and set up camp. I heard Enrico swear and I knew something was wrong. Dreams of a hot dinner of penne al pesto evaporated as we realized that the canister we had bought that morning did not fit his stove. Then the crushing realization sunk in that we only had a liter of water between us. Dinner consisted of salami, bread and some biscuits, and some strong beer to wash it down. Some time during the night, we drank half the water, not being able to stand the thirst any more. We waited patiently for the alarm to go off, then had a few biscuits and some snow-diluted-beer for breakfast. 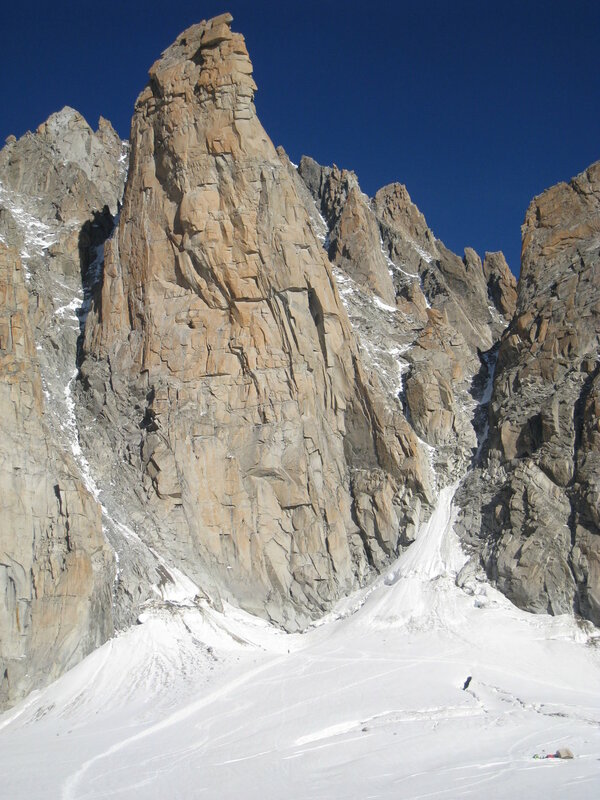 We started the slow trudge towards the Grand Capucin, as the first rays of the sun illuminated its golden granite. We crossed the bergschrund, chewed some last snow and, trying not to think too much about our thirst, started up Voyage selon Gulliver, one of the most famous modern routes (if not the most famous one) of the peak. 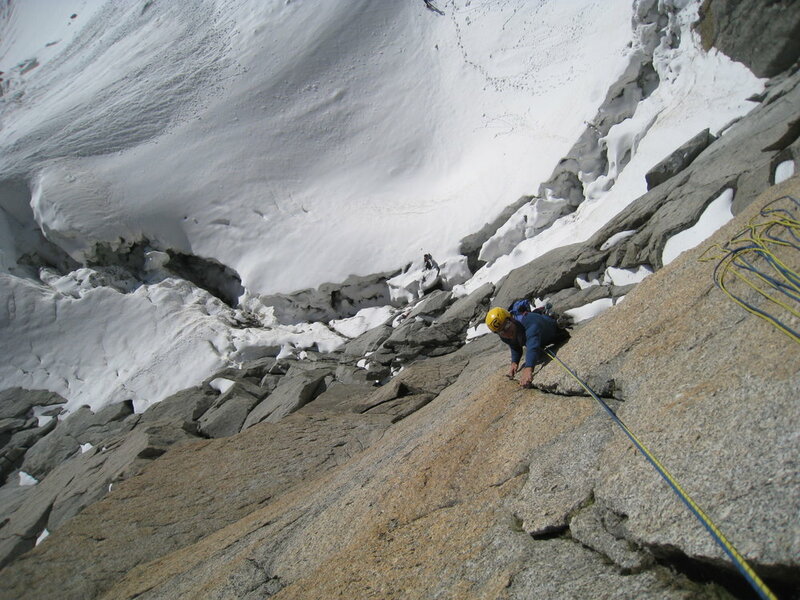 The climbing was phenomenal and we were strangely alone, apart from a party consisting of a guide and a client, a couple of pitches ahead of us. We caught up to them and politely inquired if they had any water. In an inimitable French accent, they politely but firmly responded that they only had 3 liters of it and apparently none to spare. We pushed on. The route masterfully follows the weaknesses up the face, as beautiful splitters alternate with delicate slabs. I slammed onto the wall a few times, as Enrico, around the corner and out of sight, was repeatedly whipping trying to free the crux pitch. A few demanding pitches of steep crack climbing brought us to the end of the route. Tired and dehydrated as hell, we opted to skip the summit owing to our haggard condition, as well as Enrico's freshly swollen ankle. A series of rappels brought as down to the base, as the wind picked up and the temperature started dropping. We slogged back to camp, got into the tent and just lied there for a while, cooking duties not applicable. We had some beer with no food to go with it, and then tried to sleep.